Belkin WeMo Light Bulb Review: Are WeMo Lights Good for Beginners? 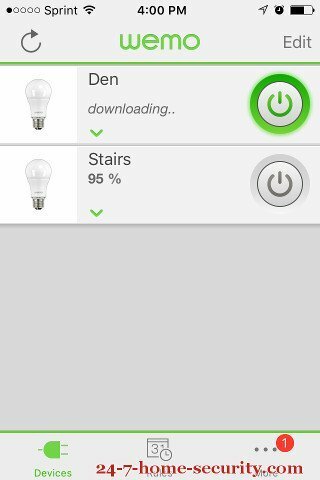 At first glance the Belkin WeMo light bulbs look ideal for someone new to home automation. 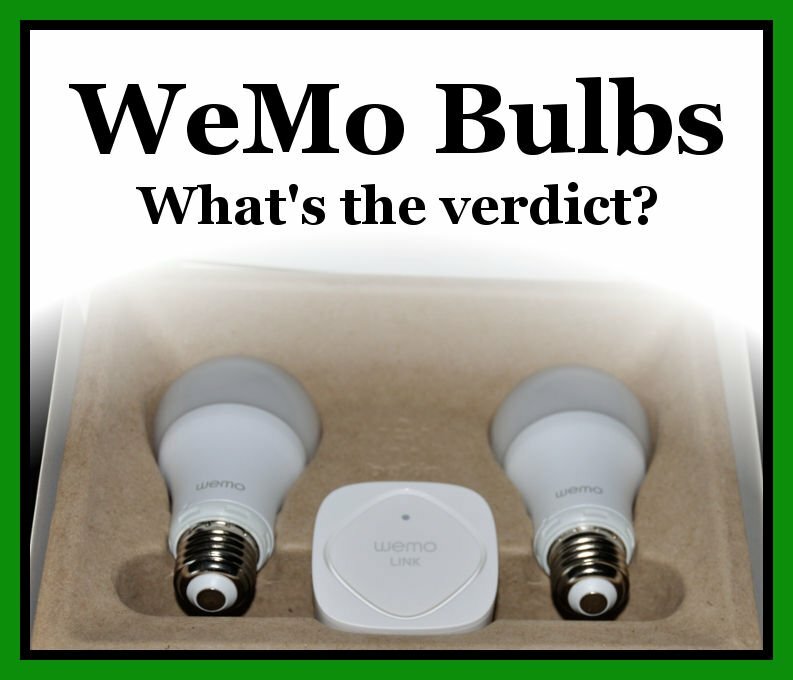 The WeMo LED lighting starter kit is everything you need in one affordable box. I’ve thought about spreading the home automation cheer this holiday season with it. The WeMo light bulbs and Link hub are a compelling deal at $40 to get started with smart home lighting. But, software problems were flies in the ointment during our time with the product. The reliability just isn't there to recommend the WeMo lights and app at this point. I already mentioned that the Belkin WeMo products look attractive for smart home beginners. Most of the Belkin products are strictly WiFi with no hub required to do translation, and everybody has WiFi these days. But, there are some great possibilities here beyond just light bulbs. Diversity of products – no other smart home brand offers a crock pot, coffee maker, and air purifier that works with its app! That’s before we get to the bulbs. As for the Belkin WeMo LED bulbs themselves, they are just as cheap as the GE Link or Cree Connected bulbs if you shop around(check out our smart bulb review and comparison here) at $15. The bulbs use the Zigbee protocol, but I haven’t seen any integration with other hubs yet sadly. For now, you’ll have to get the WeMo Link (that’s included in the starter kit) to serve as your hub. Fortunately for those that are sold on home automation yet, the WeMo Link is much smaller than most hubs and can be easily tucked away in an outlet somewhere. The only caveat is that it needs to be in a central location for reliable communication with the bulbs. Finally, the connection to other products with IFTTT is crucial. For the uninitiated, IFTTT ties together all kinds of systems like your smart phones and alarm systems. 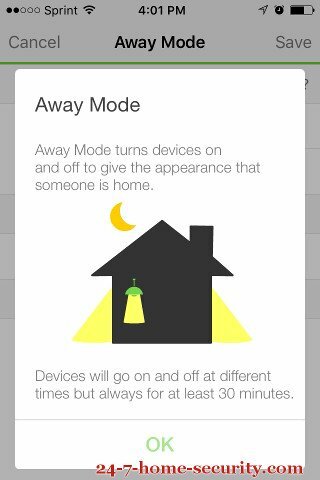 Imagine having your Scout or iSmartAlarm alarm systems turn on the lights in the house when it goes off. It’s a great set of software that enables all sorts of neat home automation ideas. And, there are NO monthly fees! 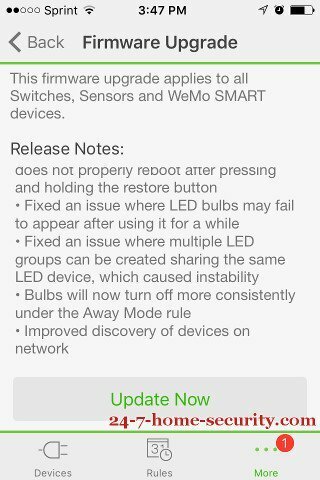 The WeMo LED bulbs are pretty standard out of the box. One thing that does jump out if you’ve seen the GE Link or Cree bulbs is the WeMo bulbs are fully enclosed in an opaque plastic with no vents. But according to the projected life at 25,000 hours, it doesn’t hurt their longevity any. 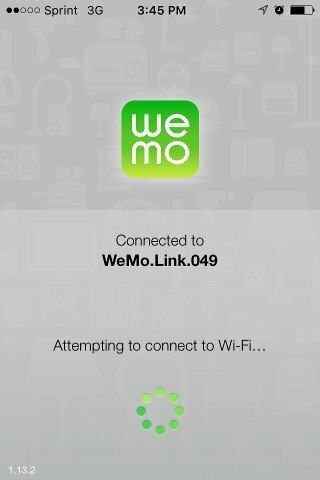 The WeMo Link itself is a pretty compact affair, not surprising when it only has to fit WiFi and Zigbee radios inside. The only thing that may give you pause is that it plugs directly into an outlet, so you don’t have as many options when deciding where to position it. The instructions to get started are right in the box, and it’s really just a matter of finding a home for the Link and plugging it in. Then, screw in the bulbs and turn the lights on while you install the bring up the WeMo app, which guides you through the entire process of connecting to the Link’s standalone WiFi network and then joining it to your own network to enable access from outside your home. You’ll have to leave the switch for the light on at all times to automate the bulbs. The warning above generally means that any light that you will also need manual control over may not be the best fit for smart bulbs. That’s especially true if you or someone else in the house to regularly going to forget and turn the switch off. In a lamp that’s only on after dusk is a good candidate, as is other accent lights that are only used during certain time windows. In that case, you might want to see our reviews of the Aeotec Micro Smart Switch or the GE line of smart switches. Check out more pros and cons of smart bulbs and smart switches if you’re still torn. 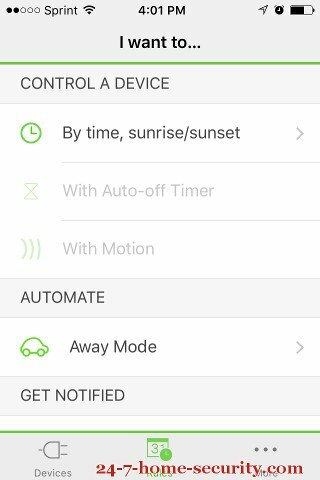 How’s the WeMo app anyway? When you fire up the app, it’ll launch right into to signing you in and going through the setup of your new bulbs. 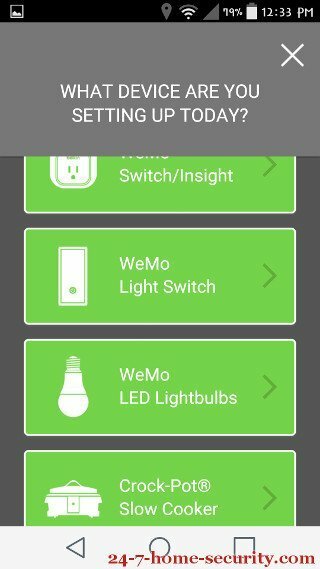 If you chose a good location for the WeMo Link, you’ll be able to connect to the Link’s own WiFi network before it does a search to find the new bulbs. For me, it all went off without a hitch until a minor error setting up remote access. Fortunately, that was successful on the second attempt. As far as the app itself, it’s pretty straightforward with just the bulbs connected. The main screen will let you quickly turn the WeMo smart bulbs on and off with your connected phone. And as soon as you configure the Link to talk to your existing WiFi network, you’ll be able to control them remotely from outside the home as well. The only other hiccup I had during the setup process was getting new firmware to one of the bulbs. It was close enough to be controlled by the Link, but the firmware download just didn’t want to take. Unfortunately, the same problem persisted throughout the review period, constantly prompting me to update the firmware that would never successfully update. This sure is taking a LOOONG time! 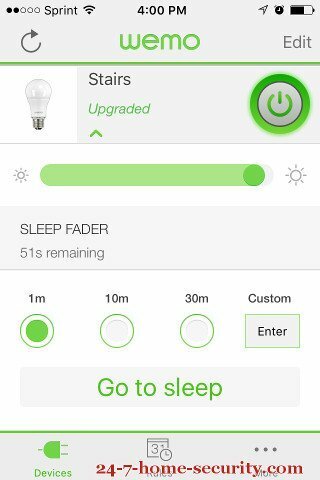 Using the drop down beneath each bulb, you can quickly set sleep timers to fade the lights off over a configurable time range when you’re ready to go to bed. Sometimes you’ll like having the manual method, but the real fun is automating things with rules of course. Those sunrise/sunset offset is particularly nice for someone who doesn’t like the preset sunrise and sunset times that come with your cloud service from Wink or Staples (problems I had). That way, you don’t have to constantly update the time your lights come on at night as the length of days change. 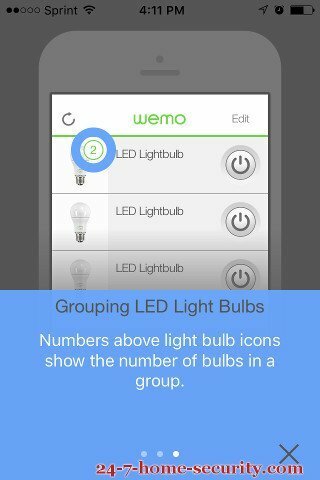 The WeMo app also lets you group bulbs into a single set of bulbs. That way, you could easily control all of the lights and lamps in a single room. The app walks you through the process, which is very intuitive. So Why the Bad WeMo App Ratings? Any one of those would give you pause, and the WeMo app reviews have them in droves. There are some that get on well with it and review the app well, but there are many more that don’t. So, consider their experience along with mine as you weigh whether or not the WeMo is the best home light automation solution for you. I’ve heard that some of the issues are related to the iOS 9 app and not the Android app, but looking at the forums these problems have persisted for at least a year without a fix. That doesn’t give me warm fuzzies about recommending the WeMo lights for beginners! Are the WeMo Bulbs Reliable? In short, the actual bulbs are nice. They don’t have any of the streaky lighting of the GE Link bulbs we reviewed due to their opaque outer cover, and they’re affordable, white-only smart bulbs. 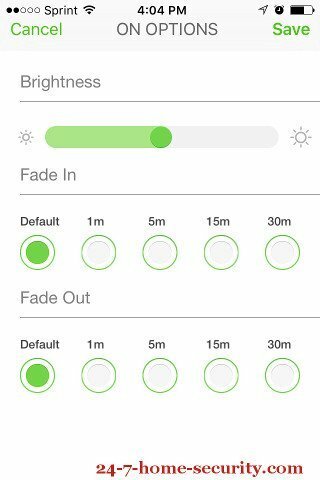 When controlling them manually from the WeMo app, they were always responsive and had dimming and lighting performance comparable with the Cree and GE bulbs. Unfortunately, the inconsistencies of the software causing rules to be forgotten and not updating devices put a damper on our review. At first glance, the Belkin WeMo lights are attractive for the uninitiated smart home consumer. The lighting kit is affordable and offers some unique options in the Osram indoor and outdoor lighting strips that you won’t find with other kits. And, the wide variety of other WiFi Belkin products is also alluring for people who don’t want to buy a dedicated home automation hub. You can get a coffee maker, crock pot, smart outlets, and more. 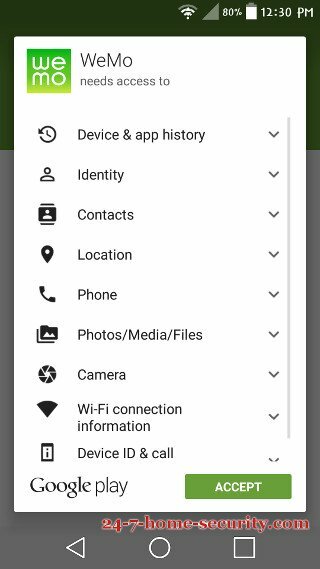 And, the app’s interface and use is well-designed and easy to pick up. 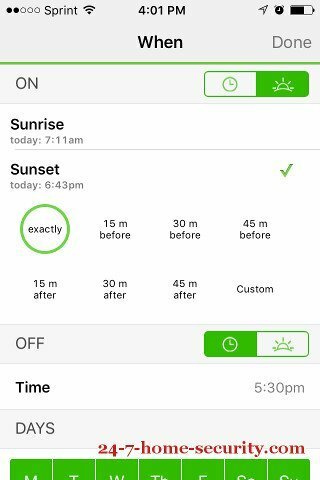 The WeMo app even allows scheduling around sunrise and sunset with custom times and are beyond anything we’ve seen and very handy! Unfortunately, the execution just isn’t there in the long term with created rules being dropped and failed firmware updates. Could you get these things sorted out by using an Android device while Belkin works on an iOS app update? Do you want to deal with the headache with more reliable options out there for controlling Zigbee bulbs? 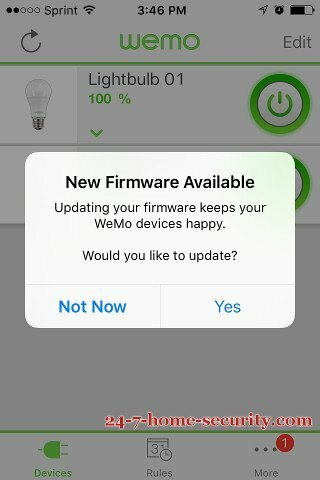 I would hold off on the WeMo lights until the bulbs are compatible with other home automation hubs or Belkin releases fixes for the rules and device updating problems. I don’t know if I’d go really high end like the Beon lights. But if you’re looking for a good alternative to the WeMo lighting starter kit, we like the Staples Connect hub with Cree Connected lights. Appreciate the review? Say thanks by passing it around! You read an article about light bulbs to try to figure out a DIY security system? Did you read http://24-7-home-security.com/who-makes-the-best-diy-security-systems/ yet?